William Perry: These photos reflect my inspirational background work for Toujours Provence, and are quite colorful. The second movement of the upcoming Toujours Provence orchestral suite celebrates the fields of lavender (top) photo for which Provence is famous. The third movement is a depiction of Van Gogh’s famous “Café Terrace at Night” painting. The café (bottom), which is in Arles, pretty much exists as it did in Van Gogh’s day. William Perry, far right: At the premiere of the Gemini Concerto on May 8, 2010, performed by the Albek Duo – violinist Ambra, far left, and pianist Fiona to the right of Paul Phillips, conducting the Pioneer Valley Symphony. Next to me is my wife, Marina, a ballerina from the Bolshoi Ballet in Moscow; she provided a visual element during the Concerto with signs and costumes introducing each of the cities and countries in the various movements. 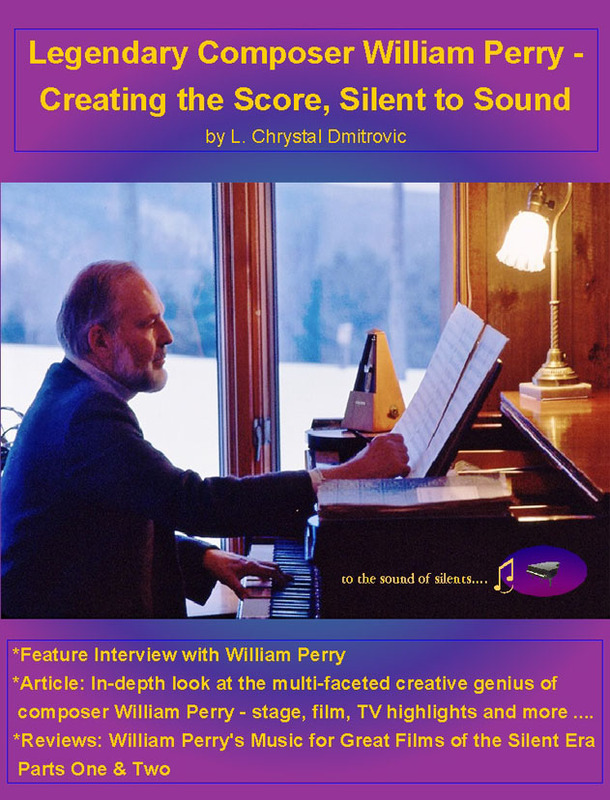 Michael Chertock, chair of the piano department at the College-Conservatory of Music, University of Cincinnati, and who appeared as piano soloist in selections on both Music for Great Films of the Silent Era CDs, shares that “William Perry’s music is a perfect reflection of his personality: irrepressibly enthusiastic, colorful, optimistic and lyrical. My first opportunity to play the piano parts of the rhapsodies for Bill was actually over the phone! Bill is a very generous spirit, and he made only a few small suggestions about tempi and phrasing. William Perry: In an editing session in Vienna for The Mysterious Stranger with the celebrated Swiss/American recording engineer, Marc Aubort, 1982. Welcome to Show 8 of the Ultimate Movies Broadcast, November 2016. Another mini-show, we’re featuring the 2nd installment of The Literary Prose & Poetry Corner. Toronto area poet and writer, Lawrence Arthur Kosowan, attended the same high school as Lorraine Dmitrovic, and they sang in the school choir together. They have known each other since 1972. Today Lawrence, also known as Larry, participates in many local area writing groups, and he recently did a reading at the first hugely successful ‎Scarborough Arts‎ – Art in the Park: Harrison Properties event held in Toronto this past August. For mini-show 8, Lawrence reads his two prose poem works “Ten Days into April” and “A Light Sketch,” copyright 2016. 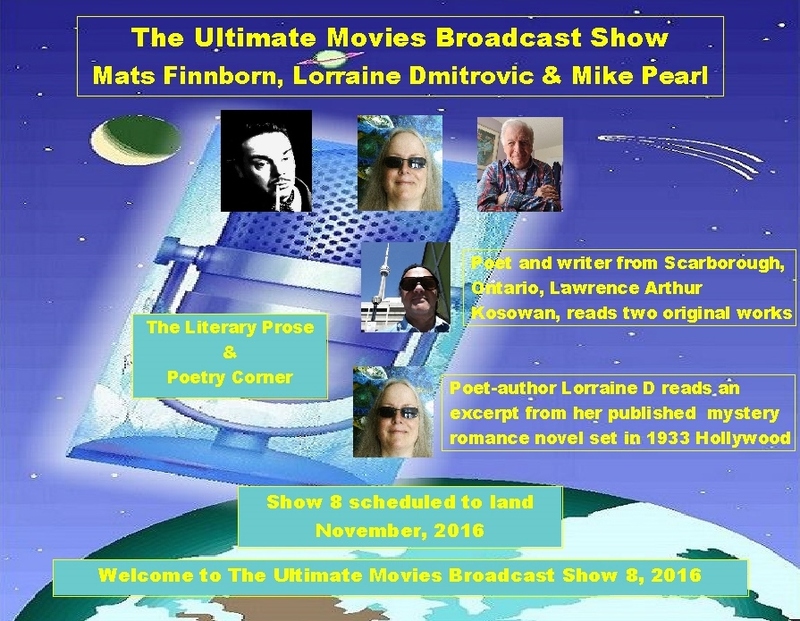 This show, co-host Lorraine Dmitrovic reads from her romance-mystery novel set in 1933 Hollywood. A true mystery, I can’t reveal the name of the novel, written and copyright 1999 and released in 2000. She wrote her novel under a pen name, which shall also remain a mystery. She originally wrote the romance novel, part one of a trilogy, as though she were watching a movie unfolding upon the big screen.